President Obama’s State of the Union address in 2014. A Gallup poll released Monday found that just 35 percent of registered voters are more excited than usual about voting in November’s midterm elections. That’s well down from 2010 and somewhat down from most other midterm years when Gallup has asked this question. Midterm elections normally generate less voter enthusiasm than presidential years, so this isn’t all that high a bar to clear. It would be easy to blame voters for their apathy, but perhaps they could use a breather. The past 14 years have featured a number of exceptionally exciting elections with control of the federal government at stake. This year, it probably isn’t. It’s extremely unlikely Democrats will win back the U.S. House in November. The party that’s in the White House very rarely gains seats in midterm elections, and Democrats also face headwinds because there are far fewer swing districts than there used to be. It would take a very strong Democratic year for them to win back the House, and the political climate for Democrats appears to be somewhere between fair and middling (with some chance that could turn into an outright poor year for them). Of course, President Obama will control the White House through 2016. So, there will be a Democratic president and, almost certainly, a Republican check on Obama’s power in the Congress. The Senate is very much in play. But a GOP-controlled Senate would be somewhat redundant. Republicans already exercise a “veto” on Obama’s power in the House and, with party-line voting and political polarization near their all-time highs, this suffices to make Obama a lame duck except on initiatives he can pass through the executive branch alone. That isn’t to say that Senate control doesn’t matter at all. It certainly matters in the long run. In 2016, the Senate landscape isn’t favorable to Republicans, as they’ll have to defend seats in a number of blue states they won in the GOP wave year of 2010. Unless they make considerable gains this year, they’re unlikely to have much of a shot of controlling the Senate after 2016. Furthermore, the Senate has the sole authority in Congress to approve Supreme Court nominations, along with Cabinet appointments and treaties. There’s the prospect of Ruth Bader Ginsburg or another justice retiring within the next two-and-a-half years. Nor does this say anything about the races in states and localities, which account for about 40 percent of all government spending in the U.S., and which provide the farm systems that allow parties to develop future presidential and congressional candidates. The gubernatorial races in a number of large states, including Florida, Ohio, Pennsylvania, Michigan and Wisconsin, appear to be very competitive. This is not an election without consequences. It’s just that the consequences are a little lower than the ones that we may be used to. 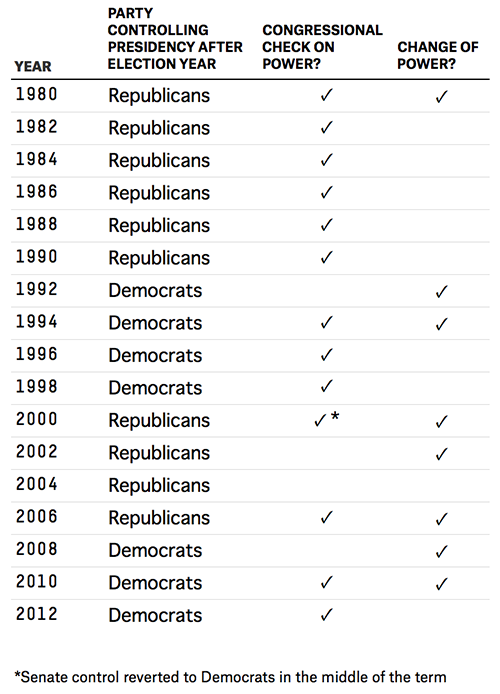 The table below documents the disposition of the federal government after each election since 1980: which party controlled the White House, and whether the opposition party exercised a check on power by holding at least one branch of Congress. Seven of the past 11 federal elections have featured changes in power: 1992, 1994, 2000, 2002, 2006, 2008 and 2010. The exceptions were 1996, 1998, 2004 and 2012. But in 2012, it was plausible for Republicans to win the presidency; the FiveThirtyEight forecast model gave them about a 40 percent chance of doing so in May 2012. It was also plausible the GOP would win the Senate, until the party faded late in the race. The 2004 election was parallel to 2012 in some ways. The presidential election was close, and the Republican edge in the Senate was thin heading into the election year. It’s less clear whether Democrats had much of a chance of taking the House in 2004, but they had reasonable odds of winning a check on George W. Bush’s power in some way. The late-1990s elections were duller. As the economy gained steam in the mid-1990s, Bill Clinton became a fairly clear favorite to retain the presidency in 1996. Democrats gained a couple seats in the House, but not nearly enough to retake the majority. And they lost a net of two seats in the Senate, despite Clinton’s re-election. In 1998, after the Republican Party grew unpopular in the wake of the Clinton impeachment trial, Democrats had some hope of winning the House. Democrats wound up gaining a few seats — far better than parties usually do in midterm years — but that may have been toward the upper bound of their plausible performances. The Senate, where the Democrats needed to gain five seats while defending more seats than the GOP, was another problem. But relatively sleepy election years like 1996 and 1998 were fairly common in the past. The parties were in a long stalemate between 1980 and 1992, with Republicans controlling the presidency and Democrats retaining a large edge in the House. Back then, at least, the parties behaved in a more bipartisan fashion. So the outcomes were less binary, and the margins of control in the House and the Senate mattered more. Ronald Reagan and George H.W. Bush were far from being lame ducks at this time in their tenures. The caution, of course, is that all of this is easier with the benefit of hindsight. In 1994, voter enthusiasm was initially fairly low. But it proved to be a monumental year as Republicans regained the House for the first time since 1955. Even then, however, polling showed the GOP with a chance to win the House fairly early in the year, so its win didn’t come out of nowhere. Perhaps the polls are missing a Democratic wave that will make the House competitive in November. Otherwise, the consequences of this year’s federal elections are mostly in how they’ll set up 2016, and not how they’ll affect Washington in the interim. By all means, go out and vote! Just be skeptical if you hear that 2014 is the most important election of your lifetime, as parties, pundits and politicians almost always claim sooner or later. This election isn’t so special. Correction (May 13, 4:05 p.m.): A previous version of this post incorrectly said the Democrats lost House seats in 1996. They won two seats.